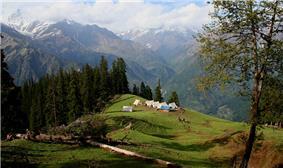 Camping is an elective outdoor recreational activity. Generally held, participants leave developed areas to spend time outdoors in more natural ones in pursuit of activities providing them enjoyment. To be regarded as "camping" a minimum of one night is spent outdoors, distinguishing it from day-tripping, picnicking, and other similarly short-term recreational activities. Camping may involve sheltering in the open air, a tent, caravan, motorhome, or primitive structure. Luxury may be an element, as in early 20th century African safaris, but including accommodations in fully equipped fixed structures such as high-end sporting camps under the banner of "camping" blurs the line. 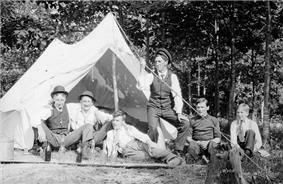 Camping as a recreational activity became popular among elites in the early 20th century. With time, it grew more democratic, and varied. Modern participants frequent Scouting, which use it to teach both self-reliance and teamwork. Camping describes a range of activities and approaches to outdoor accommodation. Survivalist campers set off with as little as possible to get by, whereas recreational vehicle travelers arrive equipped with their own electricity, heat, and patio furniture. Camping may be combined with hiking, as in backpacking, and is often enjoyed in conjunction with other outdoor activities such as canoeing, climbing, fishing, and hunting. There is no universally held definition of what is and what is not camping. Fundamentally, it reflects a combination of intent and the nature of activities involved. A children's summer camp with dining hall meals and bunkhouse accommodations may have "camp" in its name but fails to reflect the spirit and form of "camping" as it is broadly understood. Similarly, a homeless person's lifestyle may involve many common camping activities, such as sleeping out and preparing meals over a fire, but fails to reflect the elective nature and pursuit of spirit rejuvenation that are integral aspect of camping. Likewise, cultures with itinerant lifestyles or lack of permanent dwellings cannot be said to be "camping", it is just their way of life. 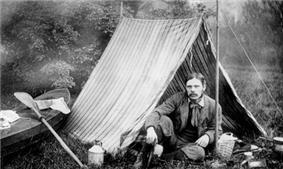 Thomas Hiram Holding outside his camping tent. The father of recreational camping in the UK was Thomas Hiram Holding, a British travelling tailor. He experienced camping out in the wild from his youth, when he had spent much time with his parents traveling across the American prairies. Later he embarked on a cycling and camping tour with some friends across Ireland. His book on his Ireland experience, Cycle and Camp in Connemara led to the formation of the first camping group in 1901, the Association of Cycle Campers, later to become the Camping and Caravanning Club. He wrote The Campers Handbook in 1908, so that he could share his enthusiasm for the great outdoors with the world. Possibly the first commercial camping ground in the world was Sir Robert Baden-Powell (founder of the Boy Scouts movement) became its president. The International Federation of Camping Clubs (Federation Internationale de Camping et de Caravanning) was founded in 1932 with national clubs from all over the world affiliating with it. By the 1960s camping had become an established family holiday standard and today camp sites are ubiqitous across Europe and North America. Adventure camping is a form of camping by people who race (possibly adventure racing or mountain biking) during the day, and camp in a minimalist way at night. 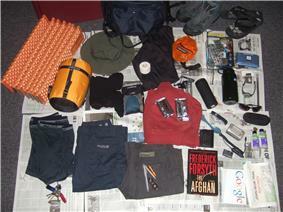 They might use the basic items of camping equipment such as a micro-camping stove, sleeping bag, and bivouac bag. Dry camping is camping at a site without a reliable preexisting water source; such locations are known as dry camps. Campers must carry their own water in and out of camp, which requires much more preparation than would otherwise be required. Dry camping is very common in deserts, and is often preferred due to the risk of flash floods. Backpacking affords a maximum wilderness experience. Specialized gear allows enthusiasts to both enjoy popular local recreational spots and access the most remote locations. Technological advance and consumer interest in camping have led to lighter and more diverse backpacking gear. Improvements such as titanium cookware, ultra-light wicking fabrics, and heat-molded hip straps make for lighter loads and enhanced performance. As there is always the possibility of severe weather and injury in the backcountry, cell and satellite phones are sometimes carried for emergencies, with varying coverage. Backpacking may involve riding or being accompanied by pack animals such as horses, mules, and llama. These increase carrying capacity at the expense of trail condition. Ultralight backpacking enthusiasts bring as little as possible while camping, inherently producing a smaller footprint and minimalized impact on a wilderness environment. The choice to camp with less, or even the minimum necessary to survive, may be a matter of preference (where it may overlap with "survivalist" style camping) or reflect the activity being pursued. Camping while engaging in such back-country activities as rock climbing and cross-country skiing puts a premium on the amount of gear that can effectively be carried, thus lending to a less rather than more approach. Canoe camping is similar to backpacking, and often affords much more weight and bulk to be carried when extended portaging is not involved. Electric motors or small gas ones may be attached on some canoes, where allowed, for a faster journey on the water. Waterproof bags and fishing gear are common gear. Great Victorian Bike Ride in Australia is one of the oldest and most successful examples of this, operating since 1984 and involving thousands of riders on a nine-day journey of around 550 kilometres (340 mi) each year. Motorcycle camping is more similar to bicycle camping than car camping due to limited storage capacity. Lightweight, compact backpacking equipment is used. These forms of camping involve using a powered vehicle as an essential element of the camping experience. Glamping (glamorous camping) is a growing global phenomenon that combines camping with the luxury and amenities of a home or hotel. 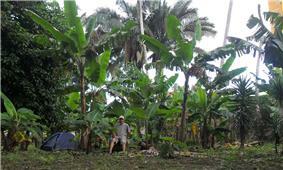 Its roots are in the early 1900s European and American safaris in Africa. Wealthy travellers accustomed to comfort and luxury did not want to sacrifice either, and their campsites and pampered wilderness lifestyles reflected it. 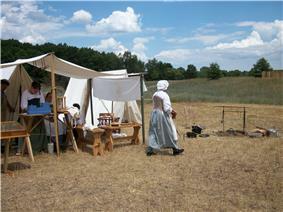 Reenactment camping employs the methods and equipment appropriate to a specific historic era for personal enjoyment and other purposes such as instruction and entertainment. Historical reenactors seek to replicate the conditions and technologies of such periods as the Wild West, American Civil War, and Medieval times. Many campers enjoy socializing with small groups of fellow campers. Such groups will arrange events throughout the year to allow members with similar interests or from similar geographical areas in order to collaborate. 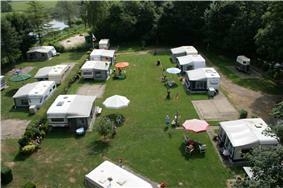 This allows Caravan Club and the Camping and Caravanning Club. Some who participate in this sort of camping feel that it brings a closer form of bonding, as members become more mutually dependent than they would otherwise be in modern society. Social camping can also build more of a bond between members of the same family and between different families. It is common for many campers to organize this type of activities with their friends or neighbors. Social camping goes beyond uniting families and it may also give the opportunity for lonely campers to enjoy this type of activity with individuals who share their enthusiasm in this matter. Because of the bonding this type of camping promotes, it can also be used as a personnel training facility. In fact, many companies offer their employees this type of training because it helps connect people who do not necessarily know each other but who need to work in the same environment and need to get along successfully. Including this type of activity in a personnel training package is becoming more and more popular and it is also recommended because of the benefits it brings. In more recent years, those who camp alone have been able to share their experiences with other campers, through blogs and online social networking. There are many online websites especially designed for people who are looking for camping companions or for those who only want to share their experiences with other people. In this case, campers may provide the others with useful tips resulting from their own experience. Individuals who are willing to camp are likely to access this type of websites and connect with other campers, especially if they are novices, because it gives them the opportunity to learn more about this activity. Survivalist campers learn the skills needed to survive in any outdoor situation. This activity may require skills in obtaining food from the wild, emergency medical treatments, orienteering, and pioneering. Urban camping is what it sounds like, and has its own unique set of circumstances. See Occupy Wall Street for a protest movement that involved elements of urban camping in a non-recreational form of extended outdoor accommodation. Winter camping characteristically refers to wilderness camping in cold seasons in temperate climates, which typically include snow, rather than in areas where snow is present year-round (such as in arctic regions or mountains high enough to maintain permanent snow cover). It puts a premium on high quality and lightness of gear, experience, and nerve – as risks may include frostbite and becoming snowbound. In addition to packing shelters such as tents or bivouac gear, alternative shelter-building skills are key, such as for snow caves and igloos. Wicking clothing suitable for layering and a regard for appropriate nutrition and food preparation are key. Workcamping allows campers to trade their labor variously for discounts on campsite fees, campground utilities, and even some degree of pay. Workcamping is usually seasonal, from May to October, although in warm weather areas such as Florida and Arizona, it can be year round. Workcamping is prevalent among retired travelers, who often own their own recreational vehicles. They will trade labor at campground tasks, such as maintenance, against fees. Camp host programs favor trades of participation in hospitality roles, such as introducing new visitors to campground facilities and organizing group activities. The equipment used in camping varies with by intended activity. For instance, in survival camping the equipment consists of small items which have the purpose of helping the camper in providing food, heat and safety. The equipment used in this type of camping must be lightweight and it is restricted to the mandatory items. Other types of camping such as winter camping involve having specially designed equipment in terms of tents or clothing which is strong enough to protect the camper's body from the wind and cold. Survival camping involves certain items that campers are recommended to have with them in case something goes wrong and they need to be rescued. A survival kit includes mandatory items which are small and must fit in one's pocket or which otherwise could be carried on one's person. This kit is useless in these circumstances if it is kept in the backpack that is left in camp. Such a kit should include a small metal container which can be used to heat water over a campfire, a small length of duct tape which can prove useful in many situations, and an emergency space blanket. These blankets are specially designed to occupy minimal space and are perfect for making emergency shelters, keeping the camper warm. Also because of the aluminum-like color this blanket is reflective which means it can be easily seen from an aircraft. Candle stubs are good in starting a fire as well as in warming an enclosed space. One or two band-aids are mandatory in this type of camping. Any camper, and not only the survival ones, need waterproof matches or a lighter and a large safety pin or fish hook which can be used in fishing. Rubber gloves, antiseptic wipes, tinfoil, jackknife, or halazone tablets (which purify the water) are also to be included into a survival kit. Although these seem too many items to be carried on one person, they are in fact small, lightweight and definitely useful. Winter camping can be dangerous without respecting the basic rules when it comes to this particular activity. Firstly, the cold is protected against with clothing of three types of layers as follows: a liner layer against the camper's skin (longjohns), an insulation layer (fleece), and a water- and wind-proof outer shell. Although cotton is one of the best quality fabrics there is, it is not recommended to be worn on winter camping because if it gets wet it dries out very slowly and the wearer could freeze. Rather than cotton, winter campers should wear wool or synthetic materials. The boots must be waterproof and the head must be protected against the cold. Although it seems a good choice, campers are advised not to wear too many pairs of socks as they might restrict blood flow to the feet, resulting in cold feet. Gaiters should also be worn to avoid snow and rain wetting the boots. Secondly, one should include carbohydrates into their diet to keep their body warm as well as to provide energy. Hydration is very important so winter campers should drink plenty of water to keep themselves well hydrated, noting that water stores must be kept from freezing. Thirdly, the tent must be carefully chosen to shelter it from the wind. Cooler to store perishables and beverages. If electricity is available, a thermoelectric or stirling engine cooler can be used without the need for ice. Campers at modern campgrounds will normally bring perishable foods in coolers while backcountry campers will bring non-perishable foods such as dried fruits, nuts, jerky, and MREs. Cooking implements such as a tripod chained grill, Dutch oven, or La Cotta clay pot can be used for cooking on a campfire. A portable stove can be used where campfires are forbidden or impractical. If using a campground with electricity, an electric frying pan or slow cooker can be used. Much of the remaining needed camping equipment is commonly available in the home, including: dishes, pots and pans; however, many people opt not to use their home items, but instead utilize equipment better tailored for camping. These amenities include heavy plastic tableware and salt and pepper shakers with tops that close in order to shelter the shakers from rain. Old kitchen gear purchased from thrift stores or garage sales may also be used in place of home items as an alternative to buying specialized (and more expensive) camping equipment. Backpackers use lightweight and portable equipment. Today’s campers have a range of comforts available to them, whether their shelter is a tent or a recreational vehicle. Those choosing to camp closer to their car ("car camping") with a tent may have access to potable hot water, tent interior lighting and fans, and other technological changes to camping gear. For those camping in recreational vehicles (RVs), options may include air conditioning, bathrooms, kitchens, showers, and home theater systems. In the United States, Canada and Europe, some campgrounds offer hookups where recreational vehicles are supplied with electricity, water, and sewer services. Other vehicles used for camping include motorcycles, touring bicycles, boats, canoes, pack animals, and even bush planes; although backpacking on foot is a popular alternative. A large recreational vehicle provides many amenities when camping. 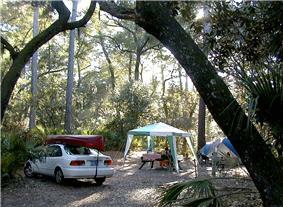 Tent camping sites often cost less than campsites with full amenities, and most allow direct access by car. 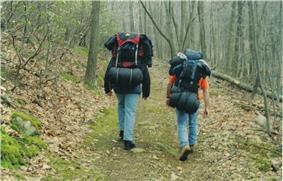 Some "walk-in" sites lie a short walk away from the nearest road, but do not require full backpacking equipment. Those who seek a rugged experience in the outdoors prefer to camp with only tents, or with no shelter at all ("under the stars"). Although many people see in camping a chance to get out of the daily routine and improve their survival skills, others would rather benefit from the many amenities that campsites are nowadays equipped with. If a few decades ago camping meant a great deal of responsibility and knowledge about wild nature, today any individual who wants to spend a weekend away in the woods may also expect a high level of comfort. The amenities that can be found in a campsite vary greatly, as do the prices campers must pay to use them. Usually, the most visited places tend to be more comfortable, more sought after, and more expensive. The cheapest option when it comes to camping still remains backpacking or tent camping, although it can lack some of the comforts of other options. Many companies manufacturing camping accessories produce different types of equipment or gear that is intended to make camping a more comfortable activity. The gear used in camping is crucial and it can be a life saver. The right tent or food storage unit can easily save campers from insects or even bear attacks. The camping community has been known for its proclivity towards leaving unused gear at the trailhead for other hikers to use or swap. From 2012 to 2013, over 40 million Americans - 14% of the United States population - went camping with a net loss of only 423,955 participants. According to an infographic produced by Red Rover Camping and based on data from the 2014 American Camper Report published by the Coleman Company, Inc. and the Outdoor Foundation, camping in the United States is gaining popularity after losing a net of 4.2 million participants from 2011 to 2012. According to data provided by the Great British Tourism Survey conducted by Visit England, almost 4.5 million camping and caravanning holidays were taken by British residents during the first half of 2015, for an average of 3.7 nights. 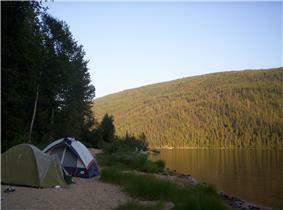 As with the United States, camping is gaining popularity, with an 8% increase in trips versus the same period of 2014. A survey conducted by Campsites.co.uk in 2014 showed that campers planned to take three trips or more each year, with 78% spending 3 nights or more away. July and August were, by far, the most popular months for camping, with fewer than 2% of respondents opting to camp during winter months. ^ Wills, Dixe (16 April 2011). "Camping? It should be about the simple life". ^ "Guide". talkCamping. Retrieved 2013-11-14. ^ "Great Victorian Bike Ride". Victoria Online. 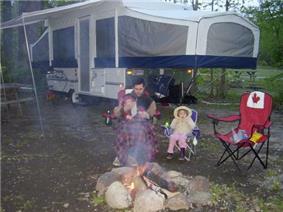 ^ Glamping' brings creature comforts to outdoors"'". USA Today. 2011-08-04. Retrieved 2011-09-27. ^ "Social Camping". Retrieved 2010-05-27. ^ "Urban Camping". Urban Camping. Retrieved 2013-11-14. ^ "Urban Camping: Subversive City Living from Times Square to Car Tents". WebUrbanist. Retrieved 2013-11-14. ^ "The Thrills of Winter Camping". Popular Mechanics. January 1933. ^ "What is Work Camping or "Workamping"?". Retrieved 2010-05-27. ^ "Winter Camping Tips". Retrieved 2010-05-27. ^ Heisey, Mary; Lao, Cua. "Camping in the United States and Its Future (Infographic)". Red Rover Camping. Retrieved 17 June 2015. ^ "2014 American Camper Report" (PDF). The Coleman Company, Inc. and the Outdoor Foundation. Retrieved 17 June 2015. ^ "Great Britain Tourism Survey" (PDF). VisitEngland. June 2015. Retrieved 21 October 2015. ^ "Camping Statistics". Campsites.co.uk. Retrieved 21 October 2015.